I have scaled Mission Peak, hiked the Dipsea and walked across the Golden Gate Bridge, and even blogged about my walking experiences, but it was not until walking parts of the Bay Trail to train for the upcoming "Nike Women's Marathon" that I realized how lucky we are to live in this part of California. In an effort to encourage my neighbors and the visitors to experience and enjoy this side of California, I would like to run a series on the San Francisco Bay Trail, a planned 550+ mile multi-use trail along the bay, hills and mountain ridgelines of the San Francisco Bay Area. Currently over 330 miles are complete. 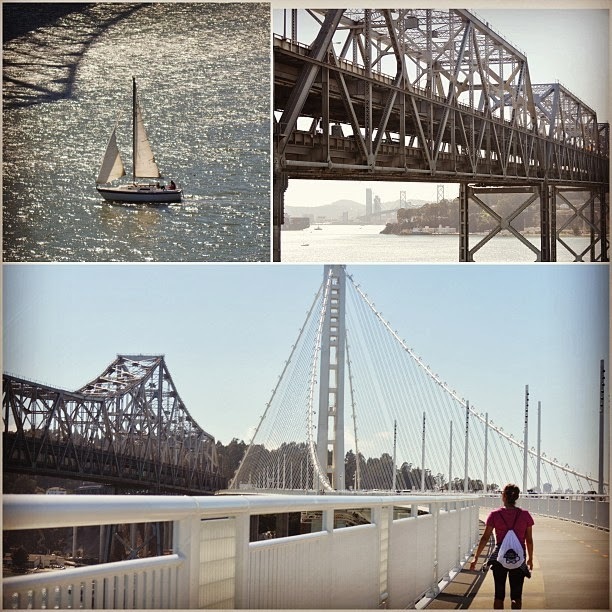 I walked the bridge with my bridge-walking buddy Jules, hoping to get some training for the Nike Women's Marathon and get at least eight miles with gradual ascend. Considering the bridge/trail's novelty, and it was the weekend, we found ourselves wandering with a group of curious seekers, walkers and cyclists. When we reached the bridge and before starting our ascent, I took a peek of the old lower span and took pictures. It was a bit nostalgic. We stopped to ponder at the old bridge, where the posts looked narrower and more fragile now. But the walk was exhilarating and enjoyable with amazing views, and white railings and the glistening new bridge tower. We spotted some black birds and ships down below and took photos. So it took us more than two hours to walk the eight and a half mile trail. Our return was much faster and perhaps from the thought of being able to get some food from the nearby shopping center where we parked our car.